This year at Frankfurt Book Fair Croatia will present its history of performance art. Featuring 149 interviews, critical essays, and 1,860 photographs that span 2,096 beautifully designed pages The Chronotope of Croatian Performance Art is a formidable and astounding testament to artists whose art clashed with all ideologies. 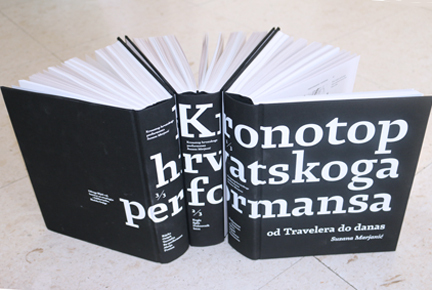 The Chronotope of Croatian Performance Art covers the history of Croatian performance art from two perspectives: the early 1920s avant-garde manifested in radical street actions and the conceptual approach of the 1960s and ‘70s initiated by Tomislav Gotovac, Sanja Iveković, and Vlasta Delimar. The social and political changes that structure the book’s chronological narrative, from The Kingdom of Yugoslavia (1918-1939) to the Socialist Federal Republic of Yugoslavia (1945-1991) and the Republic of Croatia (1991- ) entering the European Union in 2013, created unique contexts for the development of performance arts and their theme repertoire in the respective regions – Zagreb, Split, Dubrovnik, Pula, Labin, Rijeka, Osijek, Varaždin – from upending the norms of the aristocratic class, rebellion against communist regime oppression, women’s rights, sexual liberation, and, finally, activism and a harsh critique of neo-liberal consumerist society. Each of the fifteen chapters begins with theoretical background followed by interviews with individual performance artists as well as actors, musicians, theoreticians, and art historians. Featuring 149 interviews and 1,860 photographs that span 2,096 beautifully designed pages this book is a formidable and astounding testament to artists whose art clashed with all ideologies.